You don't need to worry about the perfect gift wrapper for this as Holiday Chicken Terrine can be given away with the earthenware in which it has been cooked. It does not only have that unmistakable Christmas flavor, it also has the perfect holiday look to it. 1. Trim each liver, removing any yellow or green part. 2. Cut away all connective tissue as well as the fine skin which may cover part of the liver. 3. Marinate chicken livers in bowl and season cubes of chicken meat with salt, pepper, thyme, bay leaf, red wine and cognac. Cover bowl with plastic wrapper and leave to marinate in refrigerator for 6-8 hours. 4. Remove thyme, bay leaf, before grinding meat. 5. Combine ground liver and chicken meat in large bowl. To bind meat mixture, stir in 2 eggs one at a time blending thoroughly after each egg to assure smooth consistency. 6. Add cream and pistachio nuts, stir until fully incorporated. The terrine molds should be perfectly clean and dry. 7. Line the molds with deboned chicken pieces which should be large enough to eventually cover top of terrine. Trim chicken if necessary and fold it over top to cover completely. If mold does not have a cover, use double thickness of aluminum foil and press firmly around lip of mold to hold it in place. 8. Pierce foil with tip of a skewer to make air vents so that steam created by terrine can escape during cooking. 9. Place the terrines in water bath high enough to bring water half way up the side of molds. 10. Cook terrine in low oven 170°C (340°F). The cooking time will depend on size of terrine. 11. 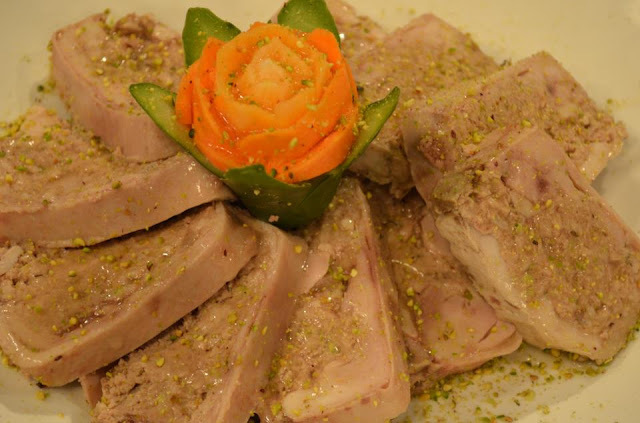 After terrine has completely cooked, refrigerate.